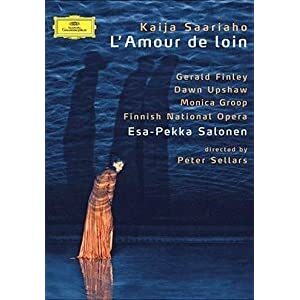 Lately I've started to explore the work of some living composers and Kaija Saariaho has quickly become a favorite of mine. A lot of her music is atonal, but often it's beautiful to my ears and it's always fascinating. Her "l'amour de loin" is arguably the most successful opera of the century so far. It was premiered at the Salsburg Festival in 2000 and since then there have been several new productions and many performances for enthusiastic audiences of the work. Jaufré, having become weary of the pleasures of life, longs for a different love, one faraway, but realizes that it is unlikely that he will ever find her. The chorus, made up of his old companions, laugh at his dreams and tell him the woman he sings about does not exist. However, a Pilgrim, recently arrived from abroad, tells Jaufré that such a woman does indeed exist because he has met her. Jaufré then devotes himself to thinking only of her. The Pilgrim, having returned to Tripoli, meets Clémence and tells her that, in France, a prince-troubadour extols her in his songs, calling her his “love from afar”. Although this initially offends her, Clémence begins to dream of this strange and faraway lover, asking herself if she is worthy to receive such devotion. Upon his return to Blaye, the Pilgrim again meets Jaufré and tells him that the lady now knows that he sings about her. Jaufré decides that he must now travel to meet her. However, Clémence seems to prefer that their relationship remains distant since she is reluctant to live constantly waiting and does not want to suffer. On impulse, Jaufré sets out to meet his “love from afar”, but not without some trepidation. He anguishes that he has not made the right decision, so much so that he becomes severely ill, that sickness increasing the closer he gets to Tripoli. Finally, he arrives there, but he is dying. The ships berths and the Pilgrim hurries off to tell the countess that Jaufré has arrived, that he is close to death, and that he asks to see her. Carried on a stretcher, Jaufré is brought to the citadel unconscious, but in the presence of Clémence, he recovers somewhat. With Jaufré approaching death, the couple embrace and confess their love for each other. When he dies in her arms, Clémence rages against Heaven and considers herself responsible for the tragedy. She decides to enter a convent and the last scene shows her in prayer. However, her words are ambiguous: it is not clear to whom she is praying on her knees, to her faraway God or to her “Love from afar”. It's an unusual opera in that there's virtually no action - all the tension comes from what goes on in the minds of the characters. Because the music is so slow one could be excused for thinking after five or ten minutes that one is in for two hours plus of boredom, but Saariaho's magical score slowly but surely draws you in and by the time that it's over you're convinced that you've just seen a masterpiece. It helps of course to have a cast of singers/actors as good as the ones we have here. It's hard to imagine anyone doing a better job than Finley, Upshaw and Groop do here in their respective parts. Leaving aside those three there's only an off stage chorus that's often used to magical effect. In another thread, I asked for an opinion on this L'Amour de Loin, nobody made any comment, so, now, I have your endorsement, thanks. It's an unusual opera in that there's virtually no action - all the tension comes from what goes on in the minds of the characters. Because the music is so slow one could be excused for thinking after five or ten minutes that one is in for two hours plus of boredom, but Saariaho's magical score slowly but surely draws you in and by the time that it's over you're convinced that you've just seen a masterpiece. It's scary to think that even after so many years of listening to music, I still have no idea how to listen to something like this, and, worse, no idea how to improve the situation, when even 5 minutes is too much. The really weird thing is that I've crossed these apparently impenetrable barriers before many times in relation to all kinds of art, but I've never understood, afterwards, what it was that made the difference other than the inexplicable growth of an actual desire to cross them. I guess it's posters like StlukesguildOhio and some_guy who made me curious enough about contemporary composers to make me want to check some of them out myself. I've tried to avoid those that based on their comments and others I expect would give me the most difficulties, but I have (somewhat to my surprise) found that there is a lot of stuff out there that I enjoy and that the music of at least a substantial group of living composers is nothing to be frightened of. 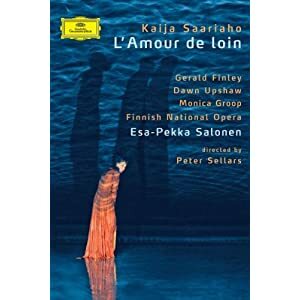 Saariaho is not an 'easy' composer, but at least on an emotional level her music isn't incomprehensible either in that it's usually clear what she's trying to communicate. Yes, I know what you mean about the writings of others. As you say, it can kindle an interest and a wish to try something new. I wonder too, though, if there's a time in our development when we might become more receptive to a particular kind of music (well, art of any kind, really). You could have played me any amount of Handel when I was 20, 30, or even 40, and I'd have found it intolerable for longer than a few minutes; but when the barriers did come down, it happened all of a sudden, and I didn't really seem to have much to do with the business beyond getting swallowed up in the unexpected pleasure of it. This is one of the most intense opera experiences I've had, no joke. 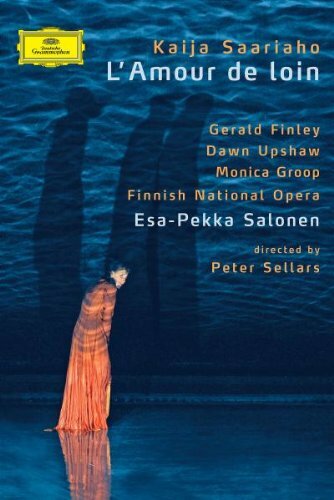 Nearly everything is in this sort of suspended animation, all the action condensed and confined (some of it even reminds me of Noh theatre), the music enormously atmospheric, the singers the best there could possibly be for their roles, stage director Peter Sellars at his most inspired, stunning libretto by Maalouf, wonderful orchestral playing by Finnish National Opera under Esa-Pekka Salonen, who has intimately known Saariaho's music since they were students together. I don't think it could get better than this for this opera. And the opera itself is truly incredible. The intensity doesn't derive from any sort of crazy cadenza-type stuff, rather entirely from cumulative force rising up from near-total stasis. It's been on the number one spot in my Netflix queue but they have the "short delay" tag on it and they've been sending other things instead. Eventually I hope I'll get it. Yes. Again. I've watched this three times today. Didn't think I would at first, but it's been gnawing at my mind all day. I remember a post about the DVD of Lady Macbeth and the title woman in tears at the end... well, Dawn Upshaw is moved to tears at the end of this opera also. She's got one incredible aria at the very end that gradually fades to absolute nothingness, and so slowly... I can't even begin to describe it. Yes, I think this is going to be one of my "half-dozen definitives" when I get around to making a contribution to that thread. Last edited by jhar26; Dec-27-2010 at 01:14. I share your enthusiasm. Many people do. This should become (and already is) a regularly performed opera. I heard it being assessed as the first masterpiece of the 21st century. I'm so curious about it! It is a masterpiece in my opinion as well. I also enjoy much of Saariaho's instrumental music. She's a very interesting composer. OK, OK already. I've ordered it. If my bank manager phones about my overdraft I'll refer her to you. I think I can relate to all three characters a bit too much for my own good. No, I'm not going into psychoanalysis. No, I'm not going into psychoanalysis.